The first VLT 8.2-m telescope (UT1) is now undergoing a "Commissioning Phase" during which all systems are thoroughly tested and further tuned. Although priority is given to technical work, some astronomical images have been obtained during the recent weeks. Some days ago, during short periods when no technical tests were scheduled, "quick shots" were obtained of two comets, both of which are designated targets for space missions. The first, Comet Wild 2 , will be visited during NASA's STARDUST mission that will start early next year. The other, Comet Wirtanen , will be explored by ESA's ROSETTA spacecraft that is due to be launched in 2003. The VLT will be able to provide important support to both of these space missions by obtaining detailed observations of the comets and their momentary behaviour. In particular, the great light collecting power of the VLT Unit Telescopes will make it possible to study these comets exhaustively when they are farthest from the Sun in their orbits and hence very faint, shortly before the spacecraft encounters. The first picture (ESO Press Photo eso9835a) is a composite of seven 2-minute exposures of Comet Wild 2 , obtained through a red filter with the VLT Test Camera in the early morning of July 25, 1998. The observations were made during rather windy conditions, about 15 m/sec, whereby substantial, variable pressure was exerted on the upper part of the telescope structure. 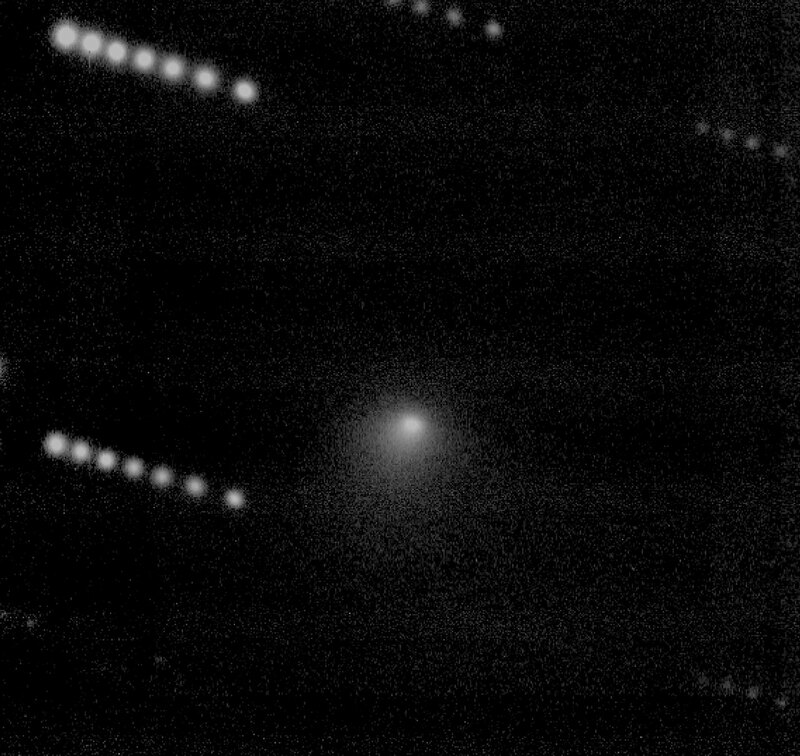 Still, the guiding worked very well and the resulting image shows the fine structure of the comet's "coma" of dust that has been released from the two-kilometre "dirty snowball" nucleus. In this combined image, the stars in the field are seen seven times each, reflecting the motion of the comet in the sky. At the time of the observations, the comet was about 400 million kilometres from the Earth and 560 million kilometres from the Sun, moving outwards between the orbits of Mars and Jupiter. No reports of observations of Comet Wild 2 have been made since last year and the present image shows the comet in unprecedented detail at the current large distance. The angular size of the visible coma is about 20 arcseconds, or 40,000 kilometres (projected). The magnitude is 17-18, about 50,000 times fainter than what can be perceived with the unaided eye. Comet Wild 2 moves around the Sun in an elliptical orbit with a period of 6.4 years. It was discovered by Swiss Astronomer Paul Wild in 1978. According to the current plan, the STARDUST spacecraft will encounter Comet Wild 2 in January 2004 and collect dust particles from the coma. At that time, the comet will be somewhat closer to the Sun and Earth than now. The STARDUST mission will bring the captured cometary dust particles back to Earth in January 2006. This will be the first time that a detailed laboratory analysis of such particles will become possible. It is assumed that this is original and widely unaltered material from the formation period of the Sun some 4.6 billion years ago. The photo mosaic is based on a series of 3-minute exposures through a red filter, obtained with the VLT Test Camera in the evening of July 28, 1998. They were performed in a bright sky (5-day old Moon high in the sky) that resulted in some straylight due to internal reflections in the telescope. 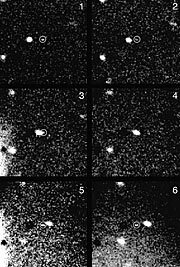 In the first three pictures (1 - 3), the very faint image of the comet (in the circles and somewhat elongated because of the motion) approaches a brighter background star from the right hand side. It is hardly visible in the next (4), since it is in front of this star, and in the last two images (5 - 6), it reappears on the left side of the star. At the time of the observations, Comet Wirtanen was 605 million kilometres (4.05 AU) from the Earth and 630 million kilometres (4.20 AU) from the Sun. The estimated magnitude is approx. 23 or beyond, i.e. over 100 times fainter than that of Wild 2. It is an impressive feat of the UT1 to observe such a faint object in such a short time and under these mediocre conditions. Comet Wirtanen was discovered in 1948 by C. A. Wirtanen at the Lick Observatory (California, USA). With an orbital period of 5.5 years, it belongs (as Comet Wild 2 also does) to the so-called Jupiter family of comets , a class of short-period comets whose orbits are repeatedly modified by close encounters with Jupiter. The European Space Agency ESA has selected Comet Wirtanen as the prime target for its ROSETTA mission, a cornerstone project of the European HORIZON 2000 programme for the exploration of the solar system. The ROSETTA spacecraft will be launched in 2003 on an Ariane 5 rocket and will arrive at Comet Wirtanen in 2012. Contrary to the STARDUST mission that is a short fly-by, ROSETTA will rendez-vous with Comet Wirtanen and will go into orbit around its nucleus. During more than one year, remote sensing and in-situ experiments will explore this object and its atmosphere (the coma) from close distance. The highlight will be the landing of a science package that will perform measurements on the surface of the icy nucleus. The new VLT exposures contribute to the monitoring programme now underway with other ESO telescopes in preparation of the ROSETTA mission. 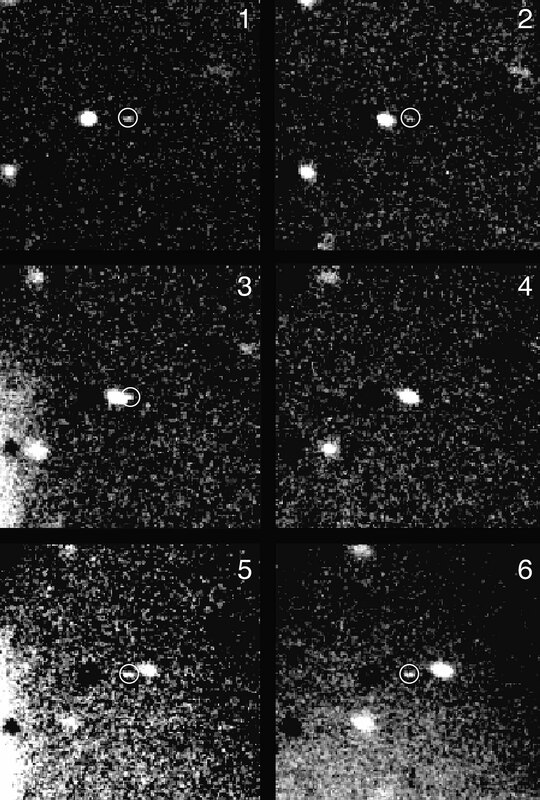 This programme has revealed that Comet Wirtanen has one of the smallest nuclei known (just over 1 km across), but at the same time one of the most active. Compared to observations with the ESO New Technology Telescope earlier this year, it appears that the comet is now much fainter and shows much less activity. The nucleus will now become frozen and "dormant" for the next two to three years until it is warmed up again during the next approach to the Sun. Further images of astronomical objects from the VLT UT1 will be published at irregular intervals.